The Palestinian Center for Human Rights (PCHR) condemns in the strongest terms how the Israeli forces and police have continued to shed the Palestinian blood in the occupied Palestinian territory (oPt), especially in occupied East Jerusalem. In the past 3 days, eight Palestinian civilians, including a child, were killed; five of whom were killed in cold blood after they attempted to carry out stabbings according to Israeli allegations. The three others were killed in other shooting incidents during peaceful confrontations; two of whom were killed in the Gaza Strip. Moreover, another Palestinian civilian succumbed to injuries he sustained last week in the Gaza Strip. In the past 3 days also, 220 Palestinian civilians were wounded, including 12 children, 2 journalists and 2 paramedics. PCHR thus condemns these crimes and calls upon the international community to take immediate action and fulfill its legal and moral obligations to protect the Palestinian civilians in the oPt. 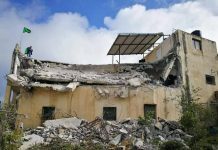 PCHR believes that the silence of the international community towards these crimes encourages the Israeli government to continue its policy that violates the international humanitarian law. At approximately 08:00, Saturday, 17 October 2015, an Israeli settler opened fire at and killed Fadel Mohammed Awad al-Qawasme (18), from al-Shaikh neighborhood in Hebron, who was present in the area between the entrance of al-Shuhada Street and Bab al-Daboya checkpoint in the city. A video posted on social media showed the settler with two Israeli soldiers, as the settler was trying to attack al-Qawasme who was lying on the ground. Half an hour later, al-Qawasme was transported by an Israeli ambulance to an unknown destination. In addition, the reason why al-Qawasme was present in that area has been unknown. On Saturday morning also, Israeli forces opened fire at and killed Mo’taz Ahmed ‘Ewisat (16), from al-Mukaber Mountain area, south of East Jerusalem. Israeli forces claimed that the aforementioned child attempted to stab a number of Israeli Border Guard officers stationed at a temporary checkpoint at the entrance of “Armon Hanatziv” settlement, south of East Jerusalem. However, the Israeli officers opened fire at him according to the Israeli radio. wound to the left thigh. Furthermore, dozens of protestors suffered tear gas inhalation. Around the same time, Israeli forces stationed at the border fence between the Gaza Strip and Israel in Nahal Oz area, east of Gaza City, opened fire at Palestinian young men throwing stones at Israeli forces. As a result, Mahmoud Hatem Mohammed Hmaid (23), from al-Shati’ refugee camp, was killed by a bullet to the head. In addition, 30 others were wounded, including 2 children. Injuries of 3 of them were serious. 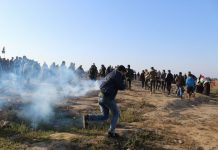 In similar shooting incidents along the border fence in the east of al-Breij refugee camp, the central Gaza Strip, and in the east of Khan Yunis, the southern Gaza Strip, 33 Palestinian civilians were wounded, including Mothanna Ibrahim al-Najjar (30), reporter of Palestine Today Satellite Channel and al-Quds Radio, as he was hit by a tear gas canister to the chest. At approximately 15:30, on the same day, Israeli forces deployed at the northern entrance of Hebron (Ras al-Joura) opened fire at Eyad Khalil al-Awawda (27), from al-Koum village, southwest of Hebron, after al-Awawda chased an Israeli soldier to stab him, as confrontations were taking place between Palestinians and Israeli forces in that area. As a result, al-Awawda sustained several bullet wounds and fell to the ground. Israeli forces and police backup arrived, while al-Awawda was transported to an unknown destination. He was pronounced dead later and submitted to the Palestinian military liaison office at approximately 21:00. Medical sources at Shifa Hospital stated, on the abovementioned day dawn, that Shawki Jamal Jaber ‘Ebeid (36), from Ezbet Beit Hanoun, succumbed to his injury. It should be noted that Shawki sustained a bullet wound to the head last Friday, 09 October 2015, when he was in his work in a stone factory, 2000 meters away from the border fence where there were confrontations between Palestinian young men and Israeli forces, east of al-Shuhada cemetery, east of Jabalia. Wednesday, 14 October 2015, due to which 2 Palestinian civilians were killed. faster, due to which the soldier opened fire at his back crying “Terrorist, terrorist”. Seder was wounded and fell to the ground. Few minutes later, Israeli forces approached and fired about 10 bullets at him from a range of five meters or less. Soon after, Palestinian civilians hurried up to the place, but Israeli forces repressed and dispersed them. Furthermore, they completely closed al-Amoud Gate area and erected iron barriers until they transported Seder to an unknown destination. following, “According to investigations, it was found out that the attacker stabbed and wounded a 70-year-old woman that was getting on a bus.” Nonetheless, Q Press website had posted a recording of an Israeli eyewitness who refuted the Israeli media and police story on the circumstances relevant to the killing of Abu Sha’ban. The eyewitness said, “He was physically liquidated right in front of my eyes. He did nothing and was not holding a knife. They all screamed ‘terrorist’ and an Israeli guard directly fired 10 bullets at him. I saw it with my own eyes. It was painful”. According to what PCHR’s fieldworkers could document, in the past 3 days and during several confrontations between Palestinian civilians and Israeli forces in the West Bank, including East Jerusalem, 66 Palestinian civilians, including 4 children, were wounded by live ammunition and rubber-coated metal bullets. Moreover, dozens of Palestinian suffered tear gas inhalation. Thus, the number of Palestinians killed since early October has risen to 39 civilians, including 8 children and a woman in the oPt. Furthermore, the number of wounded civilians has increased to 1,231, including 166 children and 20 journalists. PCHR strongly condemns these crimes that proves the increasing number of killings among Palestinian civilians in the oPt in general and occupied East Jerusalem in particular. Moreover, PCHR stresses that in the above-mentioned cases, Israeli forces could have used less force against the victims or could have arrested and tied them if their allegations were true. PCHR reiterates its call upon the international community to take immediate and effective actions to put an end to such crimes and reiterates its call for the High Contracting Parties to the Fourth Geneva Convention of 1949 to fulfill their obligations under Article 1; i.e., to respect and to ensure respect for the Convention in all circumstances, and their obligation under Article 146 to prosecute persons alleged to commit grave breaches of the Fourth Geneva Convention.